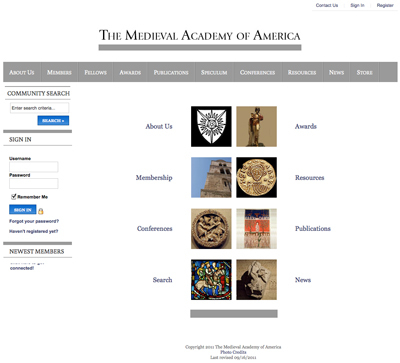 We’re very happy to inform you that the Medieval Academy has launched its new website: http://www.medievalacademy.org. As you can see, the URL remains the same but the website has some major changes and improvements. The first of these is that the old MAA website — the product of many years of incremental growth, change and revision — has now been completely rationalized and standardized. These are changes that have been recommended by several MAA committees over the past several years. Its interface is now smooth and comprehensible. As important, the new MAA interface now rests on a robust association management system (AMS): a database infrastructure that allows all parts of the website to be integrated into a powerful tool for learned societies like the MAA. Over the past year we’ve been developing this tool to insure that the deep structure and functionality of the site is optimal. Over the past month we’ve asked the MAA Council to review the functions of the site and to recommend structural modifications. Much of the content remains to be updated and expanded: we’re now in the process of doing that. So, if you see any outdated information, or would like to see further details on the site, please don’t hesitate to contact us. Among the best new features — and the one we’d like to draw your attention to first — is the personal profile page. This is the first thing that you should complete before continuing on to explore the new website. On the updated MAA home page, look to the section on the left, under “SIGN IN.” Please use the username and password provided in our e-mail of September 6. Click the “Manage Profile” link. Under “Account Information” you will see your current username and password, and next to each an option to “(change).” Please update both your username and password. Just below “Account Information” you’ll find “Personal Information“; please update this section, as you prefer. Scroll down further to the “Professional Information” section. Please enter your discipline, field, and specialty. The Discipline check boxes are set, but you can enter your closest approximation of your field and specialty, e.g., History > Italy > Religious; Literature > Old English > Beowulf; Art History > Architecture > Romanesque, France. We’ll see what the variations are and begin to form a taxonomy from the members’ entries. At the bottom of the “Professional Information” section you will find the Available to review for Speculum field. Please use this to select the Speculum review check boxes: checking one, both or no boxes will indicate to the editor and editorial boards whether you are available to be invited for reviews of articles or books for Speculum. This is the first time we’ve been able to open up this possibility for the entire MAA membership in so transparent and broad a manner. By going to the “Profile Home” page and completing these few simple steps you will now be able to fully control your personal information: to post your institutional affiliations, your CV and an image of yourself–tools that everyone is now familiar with from Facebook, LinkedIn, Academia.edu and the websites of other scholarly societies of which you are members. The most important aspect of this feature is that you can now renew and pay for your MAA membership yourself, saving both you and the staff at the MAA office the need to enter your personal information, track changes of address, or process credit card or check payments. All information is secure. For the first time the MAA will have up-to-date and reliable information on membership figures and dues payments so that we can confidently plan and expand our services and other benefits to MAA members. Please begin exploring the new site. You’ll see that in your profile section you’ll be able to search for other members and communicate with them directly. MAA and communities — from the Graduate Student Committee, to the book publication and awards committees, to CARA and the Fellows– will now be able to conduct their business in a safe and secure environment online, to host their own discussion groups and stay closely in touch. The new MAA website has been a top priority for all of us here at the MAA offices in Cambridge over the past year. Our thanks to Chris Cole for his many months of expert work heading up the project, to Sheryl Mullane-Corvi for her participation in member-related data issues, and to Katie Taronas and Paul Lindholm for their many hours of testing and reporting. We look forward to your comments and to your enjoyment and use of the new MAA website.